I am not a regular movie watcher but I think it’s fair to say that I’ve seen my fair share of chick flicks over the past 8 years. And, for all the reluctant boyfriends and husbands, I am happy to share that there are quite a few nice ones out there. When I mentioned this as a bunch of us gathered a couple of weekends a go, one of the group raised his eyebrows in disbelief and sent us a request for a favorites list the next day. 1. We Bought a Zoo: Matt Damon, Scarlett Johansson with kids and animals. Hard to go wrong but they actually did it pretty well. 2. Penelope: Great great movie. Must watch as it has a lovely message. And, as a bonus, it also has Peter Dinklage. 3. Sweet Home Alabama: Classic chick flick. We like it loads. 4. The Switch: We’re big fans of Jason Bateman. 5. The Proposal: Another classic. 6. Raising Helen: Nice move with a nice message. 9. The Wedding Date: I can’t remember/this was my wife’s pick. 10. Definitely, Maybe: I liked this one. 11. Love happens: Nice message with Jennifer Aniston and Aaron Eckhart. 12. The Wedding Planner: I can’t remember/this was my wife’s pick. 14. Pride and prejudice: The Keira Knightley version. I thought it was done well. 16. Maid of honor: I can’t remember/this was my wife’s pick. 20. The Notebook: This is a sob fest. PS: If you guys have good recommendations, I’d love to hear them too! Atrocities happen every day of the week on this planet. This was one of those that had me swearing out loud. A man felt it went against his family’s honor for his pregnant daughter to marry someone against his wishes but felt it was perfectly okay to murder her with his son and a few goons. There is a lot wrong with the world. There is no doubt about that. There is a lot right too that goes unmentioned. It feels, as a result, that we have two principal duties to help make the world better. Focus on the right in our lives and do more of it. This is the only way to keep our spirits up without getting bogged down by everything that is wrong with the world. At the same time, we must work hard on changing what is wrong. A lot of what is wrong with our attitude towards other races and women can be made much better. It starts within. We have to pledge to be open to differences ourselves and hopefully change the culture of our families and friends to reflect that. Change occurs in ripples. It begins with changing ourselves or, at the very least, teaching ourselves to think. There is a real dearth of people who can do that. Atrocities like the one above are typically committed by men (yes, it is always men) who are unthinkingly following some norm or order. The world will never be perfect but it can become better, much better. In making ourselves better, we make it a bit better and I think that’s as worthwhile a cause as any. When a few close friends and I met on a saturday evening last year, our discussion centred for a long time on the best way to give to those less privileged than us. We had all tried multiple methods – volunteering our time, giving to charities, and a fair bit of micro-lending. And, we were still discontented. I think it was because we felt we could do it better but didn’t know how. We were all intent to do this back in India as we had all grown up seeing the challenges the underprivileged face and we wanted to do our bit to make it better. That conversation in early September last year was when Help2Grow.org was really founded in my opinion. Conversations can be truly momentous in retrospect. A few weeks later, another friend shared some of the charitable volunteer work he did on a Whatsapp group that we all are part of and we jumped at the opportunity to further the discussion. “Why not start our own charity?” – we thought. And we did. We had 2 challenges in the pre-formal-founding days that we never expected. The first was picking a name. 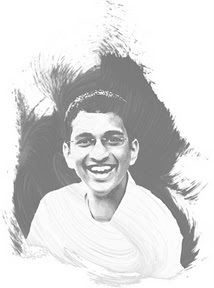 We put all the pressure on our volunteer friend and shoved what must have been close to 200 possibilities at him – again, over Whatsapp – technology really is amazing. After being stuck in the “we need a name” phase for a week, a couple of us decided we just had to hammer it down. So, the final name was picked and we were ready. Learning – many teams tell wonderful stories of how they spoke of a name and how it just “clicked.” We didn’t have any such luck. We were mentally and emotionally tired of the naming process and decided it was time to pick and focus our energies on making a difference. And, guess what, we love our name! The next challenge involved getting the India wing of the team together for the formal registration. We wanted 3 team members to sign the trust deed and, somehow, one thing or the other seemed to come up in the last minute leading to a postponement. Initially, there were whispers of this being the universe’s way of telling us what the “right” time would be (or fate). After a month of dithering, we decided it was probably not fate but the resistance. So, we promptly got it done. Learning: Yes, there are times in life when, no matter what we do, life seems intent on executing other plans. However, that is not always the case. It is also up to us to keep pushing to test the limits. We then navigated our way through the registration and began working towards our first meeting. We had 14 people interested, had registered a charitable trust, created a bank account, and were all set to go. That’s the story I’d like to share with you. It’s a story that is still being written and, most importantly, it’s a story that might not work. This isn’t a series about how to build a successful charitable trust – this is a series about our attempts at building a charitable trust that will last a 100 years. I’d like to take you through our process, failures, occasional successes and learning through the process. One of our core values is to “be transparent about why we do what we do” – so I’d also like to share our intent, dreams, and plans. Help2Grow.org is about giving to the community and there are many ways to give. We’re hopeful sharing these learnings will help too. There is a nice consulting truism that serves as a reminder from time to time – every market/client has problems and every market/client is special and, most importantly, no one really understands this (especially not those people sitting in headquarters). I’ve seen this across clients and across country organizations within the same client. Every country organization says exactly the same thing when starting out on a discussion around change. What they are really saying is – Take time to listen to and understand us. If we don’t feel listened to, we’re not going to listen to you. They’re right in part. The listening helps us in understanding the nuances that will enable us to ask the right questions. The basic principles will still work (they are basic principles for a reason) – we just have to customize them to suit the needs of our clients. But, first, you have to listen to be heard. Rent: Our rents are high – we require large amounts of your time and an unwavering attitude that is focused on serving our cause. Most of your thinking time should be devoted to making the stay of our other residents comfortable. This is not all about you, after all. 3. A willingness to, well, be pretentious. This requires a bit of elaboration – we require our residents to invest in things that fall into our “Like-able list” – all moments they feel awesome and amazing, photographs of a coffee mugs and tea-cups at all stages from all angles (actually, most kinds of photographs), “check in” from every place that might draw likes – new countries, business class lounges at airports, and, in general, we love those who share pictures of themselves sharing into great landscapes. Are you worried that you may not fit in? Don’t worry – even if you have none of these qualities but have a desire to fit in, we’ll make it work. We use state-of-the-art tools (Facebook and Instagram being on top of the list) to make sure you feel at home right from day one. 1. We consider sharing things in our “un-like list” equivalent to treason – interesting ideas, stories about your failures (boo), things that moved you, long and well thought out prose. We share similar ethos with successful public speakers and just focus on making it entertaining. Real content is frowned upon and you can rest assured that NO pretentious-stan member will like or encourage such content by sharing it. 2. We also dislike the use of social media to, well, be social – e.g. stay in touch, create meet ups in real life, etc. We allow for occasional indiscretion but, on the whole, we prefer you spend time on your phones even when interacting with your family and friends. Thank you for your understanding. We are sure you will like it here. The ones who are most in need of love..
are often the ones who are hardest to love. The same is true for most things we tend to long for (for good or for bad) – happiness, money, jobs, recognition, power, success. It always feels like the ones who have a lot of something are the ones who get more of it and vice versa. – People who make a difference don’t do it with one large decisive action overnight. The big actions we see are the sum of a lifetime of consistent small actions. PS: I’ve also learnt that, sadly, there’s not much we can do for someone who refuses to learn these things. We’re better off surrounding ourselves with folks who are happy rather than attempt to turn around an unhappy person. We only go where want to go – others can help but only so much. 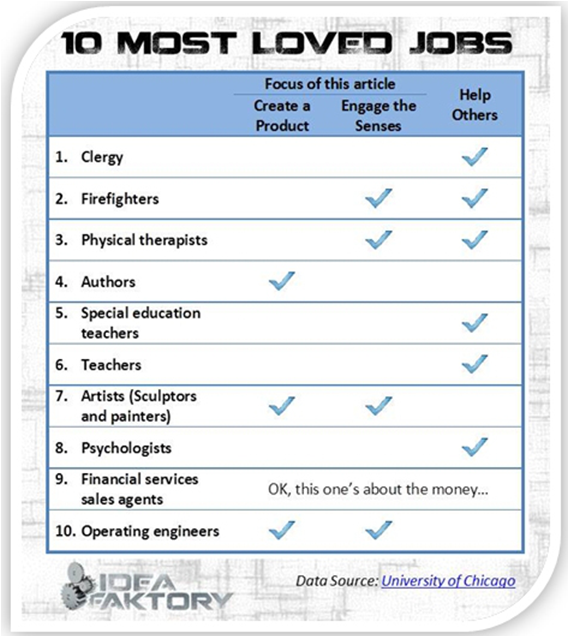 When the National Organization for Research at the University of Chicago asked which jobs made people happiest, most of the top-10 occupations involved creating a product, engaging the senses, or helping others. The ten most hated jobs, on the other hand, had a significant proportion of people stuck on a laptop. In his article “How office dwellers can become doers,” Steve Faktor argues that we need to improve happiness at workplaces by enabling people to do all of this. For product companies, engage employees more in the product building – send them to factories, keep prototypes and samples lying around, and allow for “building projects” like decorating the office. Engaging the senses can be done by livening up work spaces, introducing more plants, having 15-minute stand up meetings and standing desks, and killing unnecessary document preparation. Allow for more employee interaction and mutual help with office sports leagues and team cook-offs. As Steve points out, happiness at work cannot be downloaded. We need to make it happen.